Is China's Military Worn Out? From internal security, national defense and the expansion of strategic interests across the globe – is China’s military overstretched? The authors outline the many tasks, both new and old, that the modern PLA has to worry about: internal security, national defense against an unusually large number of neighboring states, Taiwan, and more generally, the goal of expanding China’s strategic interests across the globe – plus a lot more besides. Clearly, the PLA has plenty of contingencies that it needs to plan for, and to train for. However, there’s a big difference between being busy, and being overstretched. And it seems far more likely that the Chinese military is on top of most things, most of the time. 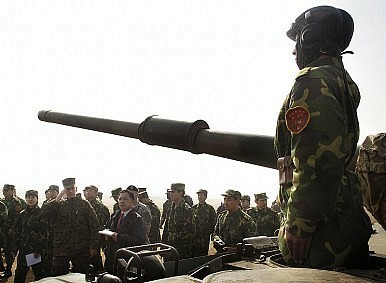 At the upper level of the military hierarchy, the PLA is no doubt a very busy army indeed. In 2011, it opened a new Strategic Planning Department in recognition of the fact that the PLA’s existing management organs weren’t coping with the complex strategic landscape that the organization now faced. Territorial disputes here and there must also be taking up a lot of military brainpower, if not actual manpower. Yet overstretch is the result of actually doing too much, not of potentially having to do too much. Consider what the PLA actually does operationally, compared with other militaries that are often said to be overstretched, and it becomes difficult to see the PLA as one of the world’s more hard-pressed armed forces. Ask the U.S. military or the British Army, for example, about overstretch: they have experienced a decade of warfare, thousands of casualties, multiple tours, global deployments, and now tumbling budget allocations. The U.S. military, on the side, also has a global empire to manage. The South African military is an even more extreme example of what overstretch really means. It is reportedly on the verge of collapse, because too few soldiers with too little funding and not enough experience are being asked to perform far too many missions. Of course, it does not follow that the PLA can’t be overstretched, simply because militaries elsewhere are under even greater strain. But operationally, the PLA still spends a lot of time practicing, and very little time actually doing. A tiny fraction of China’s total personnel is committed to peacekeeping operations. Occasionally the PLA has to intervene in domestic crises in Tibet or Xinjiang, but not terribly often. The PLA Navy’s workload has doubtless increased amidst the recent territorial disputes in the East China Sea and the South China Sea, but the military’s operational involvement in those episodes has been fairly limited. Above all, if the PLA really is overstretched, then something must have gone badly awry in its modernization master plan. Overstretch during peace time can only – as in South Africa – be the result of disastrous mismanagement. But Beijing knows what it’s doing. China’s military is in the middle of a long-term and carefully controlled modernization program, which has involved steady downsizing over many years, as well as a significant and equally steady increase in funds. Recruitment has never been a problem; money has never been a problem. So why should the force be stretched? Similarly, it is hard to think of any surprising events – there haven’t been any wars, for example – that could have upset the Central Military Commission’s planning, and opened up unforeseen gaps in the PLA’s operational capacity. If the PLA suddenly had to deal with all the contingencies that Scobell and Nathan describe, then it certainly would be overstretched. But right now the PLA isn’t invading Taiwan, or fighting a war in Korea, or repelling invasions along its long borders, or quelling a mass insurrection in the far west. It is instead engaged in a comprehensive modernization drive, along very predictable lines, with ample funds, a huge headcount, and with few operational demands to distract it. In fact, one of the PLA’s main challenges is its lack of operational experience – in other words, understretch.